The labor force participation rate (the share of working-age people who either have a job or are jobless but actively seeking work) dropped by two percentage points between the beginning of the Great Recession in December 2007 and the end of 2011, and declined even further in the first four months of 2012. A debate has recently arisen over whether this decline is a direct result of the lack of job opportunities in the Great Recession and its aftermath (these changes are generally labeled cyclical)—or is instead a result of long-run trends, such as baby boomers beginning to retire (changes that are generally labeled structural). The short answer to this debate is: Around two-thirds of the drop in labor force participation since the beginning of the Great Recession is cyclical, while around one-third is structural, according to data from EPI’s forthcoming The State of Working America, 12th Edition (Mishel, Bivens, Gould, and Shierholz 2012). Why does this debate matter? Most concretely, for close observers of economic trends, this debate is consequential because the answer allows us to determine the number of “missing workers” (workers who would be in the labor market if job prospects were strong). In turn, this helps provide a sense of how much upward pressure will be exerted on the unemployment rate if the economy begins a robust jobs recovery. While it may sound counterintuitive for a robust recovery to put upward pressure on the unemployment rate, it can happen. The unemployment rate is the number of unemployed (jobless workers who are “actively looking for work”) divided by the size of the labor force (the sum of the employed and the unemployed). If the decline in labor force participation in recent years was largely driven by otherwise-willing workers who were discouraged from looking for work because of the weak job market, a robust recovery would draw them into the labor market, boosting the labor force participation rate (as they would now be “actively looking for work”), and thus the unemployment rate. If instead a large portion of the labor force participation decline is structural—that is, if the workers who make up the decline in the labor force participation rate would not be in the labor force even if job prospects were strong—there would be no sizable influx of workers into the labor market as a robust recovery takes hold. Consequently, the unemployment rate would fall much more quickly. Given the importance of determining how much of the recent labor force participation decline is driven by near-term economic weakness (i.e., cyclical factors) versus long-run demographic trends (i.e., structural factors), this preview of The State of Working America, 12th Edition brings some evidence to bear on this debate. ** If the workers making up the difference between the 2011 labor force participation rate and its long-term trend had instead been in the labor force and unemployed. For each group except men age 55 and older, the labor force participation rate in 2011 would have been higher if it had followed its long-term trend. For prime-age (25–54) male workers, it would have been 1.6 percentage points higher; for prime-age female workers, it would have been 0.9 percentage points higher. Overall, the labor force participation rate would have been 1.3 percentage points higher. 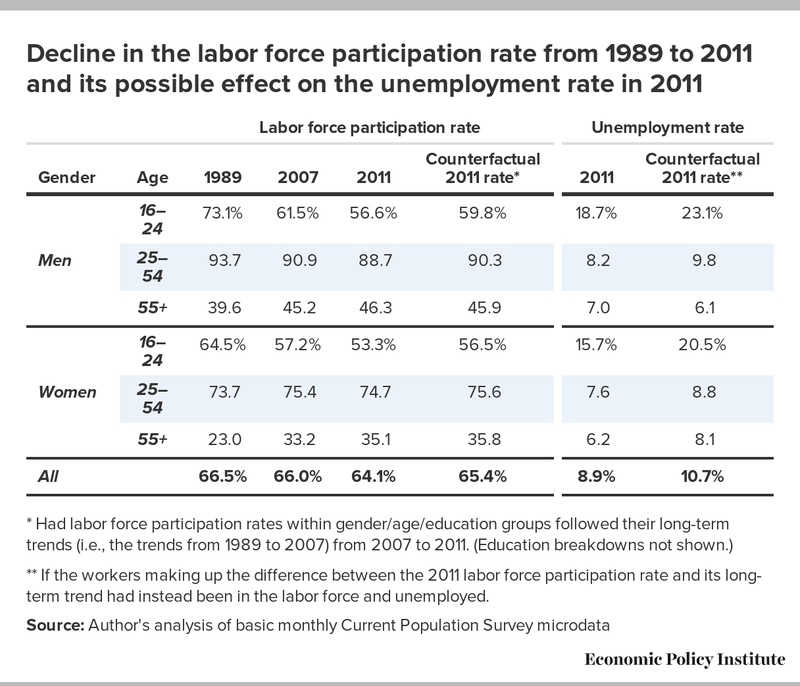 In other words, this exercise suggests that around two-thirds of the decline in the overall labor force participation rate between 2007 and 2011 (1.3 percentage points out of a 1.9-percentage-point decrease) was due to a cyclical drop in the demand for workers, and the rest (about one-third) was part of long-term structural trends. If the labor force participation rate had not dropped due to the weak labor market, and instead the people who made up the cyclical decline in the labor force participation rate were in the labor force and counted as unemployed, the unemployment rate would now be significantly higher. The last two columns of the table explore the possible impact of the cyclical decline in the labor force participation rate since the start of the Great Recession on the unemployment rate. These columns provide the unemployment rate in 2011, along with what the unemployment rate would have been if the workers who made up the difference between the 2011 labor force participation rate and its long-term trend—i.e., the workers who dropped out of, or never entered, the labor force because of weak job prospects—had instead been in the labor force and counted as unemployed. For all groups except men age 55 and older, the unemployment rate in 2011 would have been higher. For prime-age men, it would have been nearly 10 percent in 2011 instead of 8.2 percent, and for prime-age women it would have been nearly 9 percent instead of 7.6 percent. Overall, the unemployment rate would have been 10.7 percent instead of 8.9 percent. While it is unlikely that these missing workers would all be unemployed if they were in the labor market, this exercise suggests the possible scale of the effect on the unemployment rate of the cyclical decline in the labor force between 2007 and 2011. The key point here is that the large majority—around two-thirds—of the drop in the labor force participation rate since the start of the recession is due to weak job prospects, not structural factors. In April 2012, the labor force participation rate was 63.6 percent. Two-thirds of the way between that and the rate in 2007 (66.0 percent) is 65.2 percent. All else equal, if the labor force participation rate were currently 65.2 percent, there would be 3.9 million more people in the labor force. In other words, the size of the missing workforce is likely nearly four million, and if job prospects were better these missing workers would be in the labor market. Though the labor market is slowly healing, the unemployment rate is still above 8 percent, hiring is still far below its pre-recession rate, and more than 40 percent of the country’s 12.5 million unemployed workers have been unemployed for over six months. In other words, this is not yet a labor market that draws workers in. It is unlikely the missing workers will enter or reenter the labor market until job prospects are strong enough that they will not face months of fruitless job searching. This analysis—and the determination that the likely size of the missing labor force is nearly four million—shows that while expansionary policies to generate demand are urgently needed and will certainly help spur job growth, they may also generate upward pressure on the unemployment rate as these missing workers begin to enter or reenter the labor market. That kind of upward pressure on the unemployment rate would be a positive sign of the economy’s strength. 1. This exercise ignores the fact that the weak labor market from 2000 to 2007 also probably caused a cyclical decline in the labor force participation rate and simply uses the 1989–2007 trend as the long-term structural trend within groups. Thus, this exercise may understate the cyclical decline in labor force participation since 2007. Mishel, Lawrence, Josh Bivens, Elise Gould, and Heidi Shierholz. 2012, forthcoming. The State of Working America, 12th Edition. An Economic Policy Institute Book. Ithaca, N.Y.: Cornell University Press.